If you’re headed to San Diego Comic Con this year, come visit us at the ArenaNet pavilion to ride the griffon mount, get a food buff, and hang out! Meet our life-sized griffon mount and take a ride! 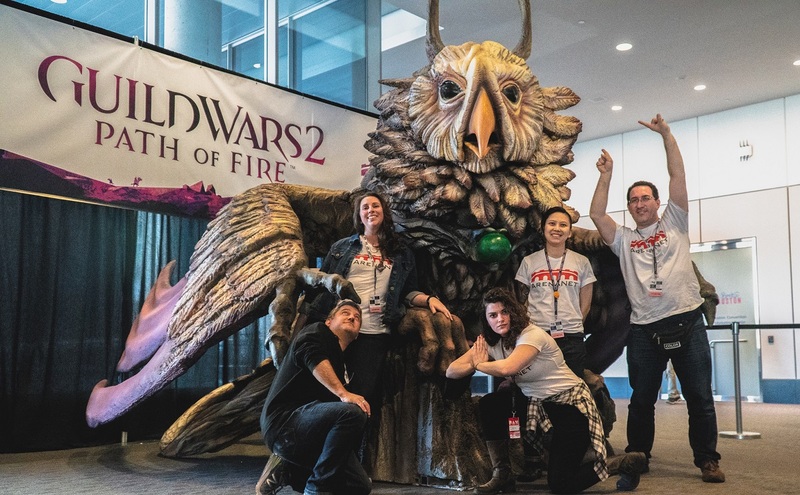 Share pictures of your griffon adventure using the #GW2IRL and #GW2Giveaway hashtags, and you’ll be entered into a giveaway to win an Amazon gift card. Griffon riding is hungry work, so don’t forget to fuel up. Our food vendor will offer a selection of Tyrian cuisine for purchase. Follow us on Twitter and Instagram where we’ll be posting regularly from the show. On Friday, July 20 at noon Pacific Time (UTC-7), tune in on Twitch for a special Guild Chat live from SDCC. We’ll take some questions from Twitter for our guests to answer.